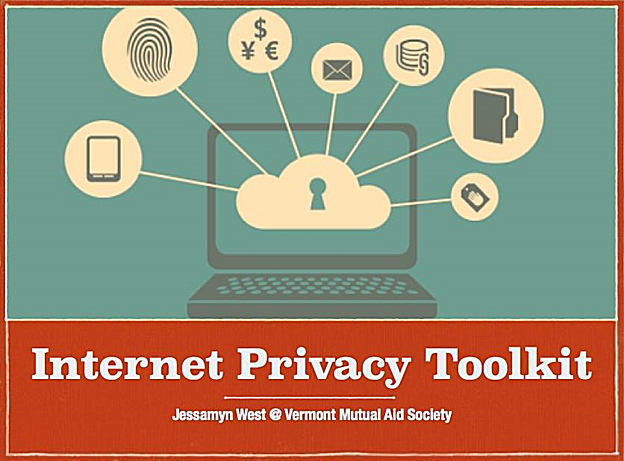 Getting good information about how to secure your privacy online can be challenging. This is doubly true if you are a technology novice, struggling to keep track of your own passwords, devices, and secret questions. You have the dual-pronged concerns of needing to learn this stuff from someone, but also not being sure who you should trust. And many people are telling you the situation is urgent but then leaving you on your own to fix it. I’ve worked on an approach I feel is useful. I run a Drop-In Time for the people in my rural Vermont community. For thirteen years people have come in with their technology questions and we’ve muddled through figuring technology stuff out together. Originally there were a lot of people needing mouse skills, email accounts, and assistance setting up Facebook. Now, there are more people with general questions about privacy, learning about the cloud, how material gets shared and re-shared, and, again, Facebook. 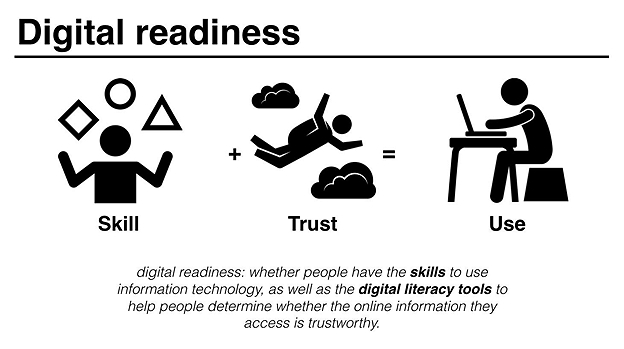 The Pew Center for Internet and Society, one of the few larger non-academic organizations continuing to do research into the digital divide, has been talking about digital literacy and the corresponding digital readiness gap. Whereas the digital divide used to refer to a lack of actual computers or sufficient broadband, now we’re seeing more people struggling with their inability to engage in self-directed learning online, while gaps in technology and broadband access still remain. This challenge–coming at a time when more and more learning opportunities are provided via technology and not an in-person human facilitator–risks leaving the most vulnerable people further behind. Pew’s research indicates that to be able to be digitally ready, users must not only have basic technology access and skills, but also an ability to evaluate and discern trustworthiness of content online, and to trust their own judgment in the absence of someone to ask. Here’s a slide I made for a talk I frequently give about how libraries can bridge the digital divide. Passwords – How to choose a good one. 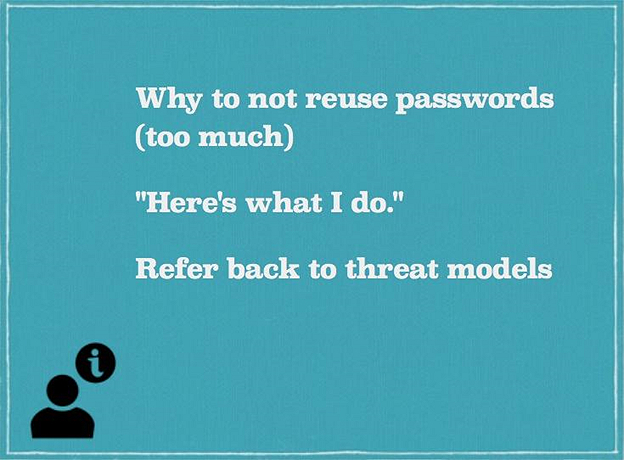 Why the passwords websites make us choose are so complicated. Sensible talk about whether to write them down or not. Internet Traffic – What to know about using public wifi. How much does your browser know about you? What are some more secure options for browsing? What browser plug-ins are helpful? Listening/Recording – What is the Internet of Things all about? Should you cover your laptop’s camera? What about all those “intelligent personal assistants” people use nowadays? Tracking – What are cookies? How do these advertisers seem to know so much about me? What are strategies for not being tracked online? More information – Who are good people to listen to? Who should I not listen to? I learned a lot by giving this talk in many public libraries around the state of Vermont. Even people who were fairly sophisticated about technology still had gaps in their knowledge. This is not surprising, considering that the business model of many popular online services is, essentially, privacy violation and they spend millions of dollars to obscure the fact that this is what they are doing. Many people also had different ideas of what “best practices” were, and enjoyed sharing what they knew with other patrons in a guided conversation. It was helpful for people who were anxious about their own technology usage to know that it fell within “normal” boundaries, and that many other people also had questions about the same topics. I eventually adapted this talk to be a talk about the talk, which I presented at the New England Library Association conference last year. It was intended for librarians who wanted to give similar talks at their own libraries. It included interstitial slides with specific advice for librarians about how to present the topics, as well as strategies for how to set up technology in their own libraries. I encourage you to use it if it solves a problem for you. My general point is this: you don’t have to be a privacy expert in order to help people learn to protect their privacy online and sometimes it helps if you aren’t. People are currently getting a lot of bad information from businesses who are trying to either sell something to them or encourage their online oversharing so that they can sell their data. Some people may not mind this, many others certainly do. People are eager for straight talk from trusted people, presented in a non-judgmental fashion; so much tech advice online nowadays takes the form of “You are an idiot if you aren’t doing things like I do.” If we want to give people information in a way that they will understand it and take it to heart, we need to have conversations with them, not give them a list of rigid rules. The librarians’ position in society as a trusted purveyor of solid information puts us in a fairly unique role as people who can and should be front and center of online privacy discussions. Helping people understand privacy helps them make better choices more tailored to their own lives and the information needs they encounter. Jessamyn West is a technology educator and LIS instructor who lives in central Vermont and blogs at librarian.net.